The Florida Weave, that’s for me. 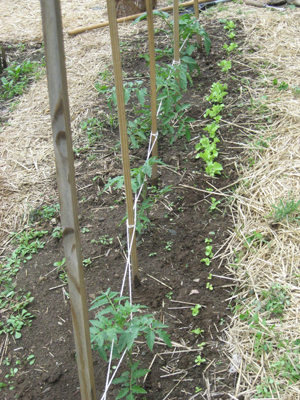 Last summer I watched my tomatoes embrace and then drag down my sturdy trellis netting. The netting supported the plants until early August. Then the weight of the fruit pulled the netting down, causing the ripening tomatoes to commit a form of slow suicide: they rested on the netting, which then cut through the skin. The air was thick with insects on the damaged fruits, and I grieved for those lost as well as the lost tone in the netting. It was all very dramatic. 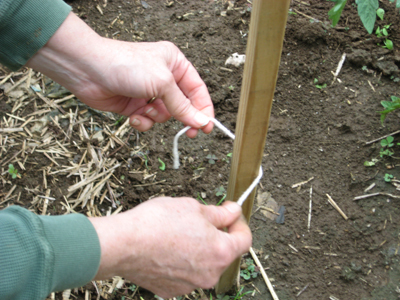 The idea is to tie the strings as the plants grow, first at 8″ and then every 8-10″ after that, as needed. 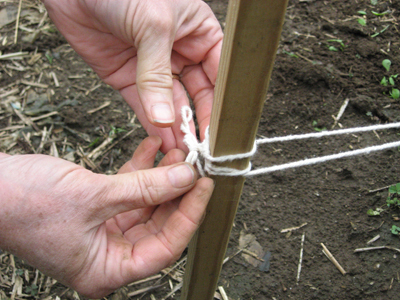 It is important to keep the string parallel to the ground. My Middle came into the garden with me yesterday afternoon and photographed while I tied. 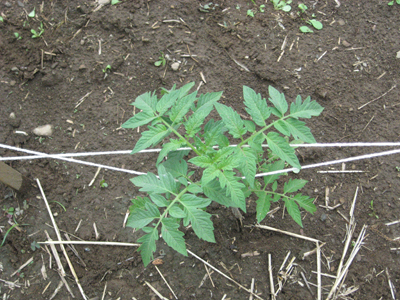 The string went past the first tomato, and the first loop went around the second stake. One plant with two strings, passing around its middle, makes for good posture. One row, with Weave in place, supported. Ending with a bow rather than a knot. Sometimes style is all! And now I wait. I’m wondering how long before the next level of string is needed? Amy — thanks for the tomato tip! I decided to plant mine between my row of giant sunflowers whose tall, thick stems I thought might lend themselves to supporting those floppy, delicate tomato vines. You know, I could probably just weave some string the same way that you have — only the sunflower stalks would serve as the stakes. You’re doing a version of the Three Sisters, then! The Native Americans planted squash, corn and beans on hilled-up dirt. The beans climbed the corn stalks for support, and the squash vines circled the mound, effectively suppressing the weeds with their abundant foliage. 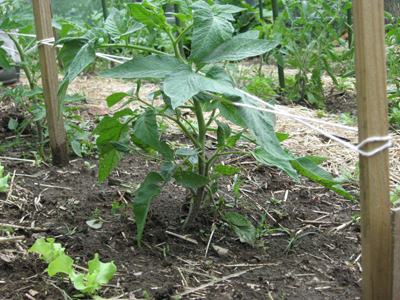 So I love the idea of you using the sunflower stalks as support-stakes for the tomatoes! Let me know how it goes! Great tip! I’ll have to try this next year. I’ll let you know how it goes — only one level of string so far. The true test will come when the plants gain height and the branches are heavy with fruit. Curious to know how this method worked when the plants were 3-4 ft tall? Yes, but it does get trickier the taller and heavier the plants get. 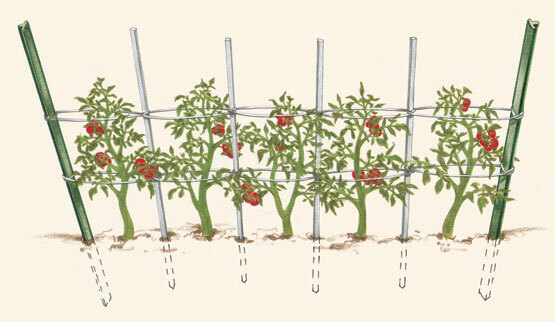 Also, if you are growing heirloom varieties that set heavy fruit, like Brandywine, I found this method to be challenging. You need to support the weight of the bigger tomatoes. 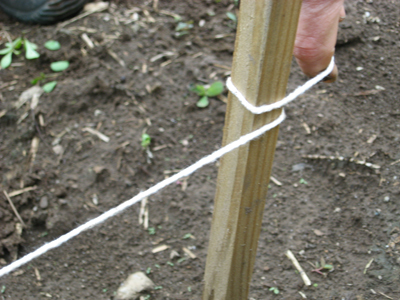 I would go with either heavier twine and more robust stakes next time I try this. I recently moved, and so am not growing vegetables this year — we shall see if I survive this decision come August, when everyone else is harvesting tomatoes! — and am hoping my choice of flowers and herbs will suffice. Good luck to you! I’d be interested to hear how you do.